If you never miss Grey's Anatomy, then you might remember that episode last season where Dr. Bailey knows she's having a heart attack but, her symptoms are dismissed because they don't present as traditional heart attack symptoms. Unfortunately, this isn't just Thursday-night fiction. There are actually unexpected signs of heart attacks in women, and these symptoms are different than those experienced by men. What's more, research published in the journal Proceedings of the National Academy of Sciences indicates that women are more likely to survive a heart attack when they're treated by female doctors who are more likely to recognize subtle signs of a heart attack. With World Heart Day Sept. 29, it's an ideal time to educate yourself about the unique heart-attack symptoms women experience so if it happens to you, you can seek treatment right away. "Chest pain, breaking out in a cold sweat, nausea, upper body pain, shortness of breath, nausea, or dizziness are the kinds of symptoms you may associate with heart attacks for men and women. For women, none of these may happen," Barbara H. Seeber wrote for Everyday Health. What's more, the Centers for Disease Control and Prevention noted that heart disease is the leading cause of death for women 35 and older in the U.S. with the highest rates being in the lower Midwest and the southern U.S. If you're not sure what symptoms to be aware of, these are some unexpected signs of heart attacks in women. Because, the more you know, the better your chances of surviving, or helping someone else survive, a heart attack. Because women experience different heart attack symptoms than men, sometimes their concerns are brushed off by medical professionals. If you suddenly experience pain, discomfort, or tightness in your jaw, and you don't have any injuries or conditions to explain this pain, the CDC identifies this as a common but little known sign of heart attack in women. If this happens to you, go to the ER immediately. 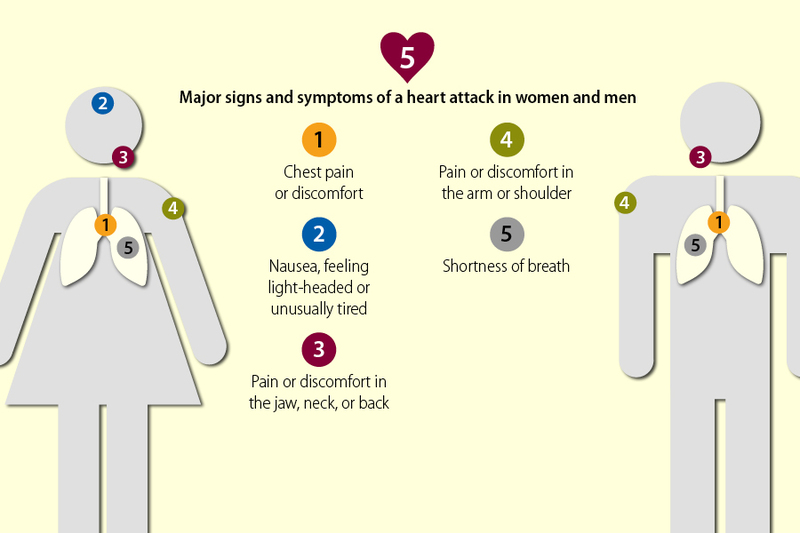 Identifying heart attack symptoms in women can be complicated because a lot of the signs are also associated with other ailments. However, according to the American Heart Association, if you experience symptoms that are uncommon to you, like sudden pain in your abdomen accompanied by dizziness or shortness of breath, it's best to get seen by a doctor right away. If you suddenly experience upper back pain or extreme pressure in your back, it might not be a pulled muscle — especially if you feel dizzy, faint, or short of breath too. Nieca Goldberg, M.D., medical director for the Joan H. Tisch Center for Women's Health at NYU’s Langone Medical Center, told the American Heart Association that some women who are having a heart attack will experience upper back pain that feel like a rope being tied around them. If the onset is sudden, and there's no reason for the pain (like an injury), get to the doctor ASAP. Heart attack in women is sometimes referred to as the silent killer because some women don't experience any symptoms at all. What's more, you could have a silent heart attack and not even realize it until much later. Deborah Ekery, M.D., a clinical cardiologist at Heart Hospital of Austin in Texas, told Go Red for Women that she often sees women who come in complaining of extreme fatigue, and it's later determined that they've had a heart attack but didn't realize it. If you suddenly become exhausted performing simple activities, like walking your dog or making your bed, seek medical attention right away. Because some heart attack symptoms in women — like cold sweats, dizziness and nausea — mimic the stomach flu, you might not realize you're actually having a heart attack if you're experiencing these symptoms , Dr. Ekery told Go Red for Women. If these symptoms come on suddenly and you're not sure if it's norovirus, food poisoning, or a heart attack, it's better to be safe than sorry by seeking medical treatment to rule out a heart attack. While not all women will experience chest pain before or during a heart attack, if you do experience unexplained chest pain that feels like your heart or chest is being squeezed, seek medical attention ASAP. If you experience any of the above symptoms for a prolonged period of time, it's important to see your doctor right away. Harvard Medical School reported that in a survey of 500 women who survived heart attacks, 95 percent of them had persistent symptoms as long as month before they had a heart attack. What's more, young women are often misdiagnosed because heart attacks aren't the first thing that comes to mind for women in their 20s and 30s. "Younger women and their doctors don't necessarily suspect a heart attack even when all the signs are there," the news release noted. "One take-home message is that some women may get an early warning of an impending heart attack in the form of excessive tiredness, disturbed sleep, or shortness of breath. Paying attention to these symptoms and getting prompt diagnosis and treatment just might stave off a full-blown heart attack." According to a study published in the Journal of the American College of Cardiology, women ages 35-55 are more likely to die from a heart attack than older women because symptoms aren't immediately identified as heart attack, which means treatment is often delayed. If you have a family history of heart disease, and you experience persistent unexplained symptoms, see your doctor ASAP. Inform your doctor about your medical and family history. While having a heart attack might seem like something that can't happen to you for decades, if you suddenly experience any of the above symptoms, trust your intuition. If you're just not feeling like yourself, identifying a heart attack early can save your life.